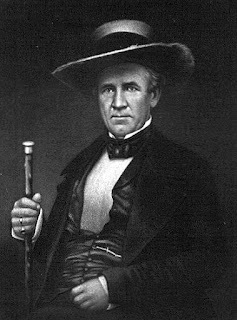 Today is the anniversary of the death of Samuel Houston in 1863. Though this word does not appear in most modern dictionaries, the story is simply too perfect to be lost to etymological history. Thankfully, Jeffrey Kacirk’s Forgotten English rescued it from obscurity. Usage lasted for about one hundred years after Sam Houston delivered a bicameral beating to Representative William Stanbery in 1832. Samuel Houston was a hard-drinking, straight-shooting pioneer renegade born in the Shenandoah Valley of Virginia in 1793 who ran away to live with a Cherokee tribe after his family moved to Tennessee. When he finally returned home in 1812, he built Tennessee’s first schoolhouse, joined the army to fight the British in the War of 1812, and took an arrow in the leg and a bullet in the shoulder before leaving the military, becoming a lawyer, and being elected to the House of Representatives in 1822. Houston eventually married and became the governor of Tennessee in 1827 but failed to serve even a single term before leaving his wife, becoming a drunk, and returning to live with the Cherokee Nation. He bigamously married a Cherokee widow and spent the next several years petitioning Washington to improve the plight of his adoptive tribe. Houston’s noble cause and his notorious temper entered the national spotlight when he decided to beat the buckeyes out of Ohio congressman William Stanbery in 1832. The whole affair was a veritable cavalcade of American frontier folklore. Davy “Killed Him a Bear When He Was Only Three” Crockett had joined Houston in his opposition to Andrew “Old Hickory” Jackson’s treatment of Native Americans. Meanwhile, Francis Scott “Star-Spangled Banner” Key was Houston’s lawyer, and future president James “Napoleon of the Stump” Polk helped reduce his sentence after he was found guilty. After also losing a separate civil suit and being fined $500, Houston did what any sensible convict would do and fled to the then Mexican state of Texas. Houston had an equally extraordinary second life in Texas. He was its first and only president when it became an independent republic in 1836, its senator after it joined the Union, and its governor until it tried to secede before the Civil War (which he opposed). Houston finally died of pneumonia in 1863, and despite Houstonize not surviving into modern times, this frontier maverick is remembered through his namesake city, countless streets, parks, and schools, and a slightly larger-than-life sixty-seven-foot statue in Huntsville, Texas.